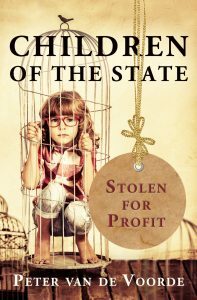 Twelve years in the making Children of the State: Stolen for Profit, presents a devastating compilation of statistics and analyses of failed family and child protection systems. It explores viable alternatives and provides a detailed account of morally indefensible international family and child protection laws and practices, which combine to provide legitimacy to the involuntary removal of millions of children from their biological families. Cumulatively impacting more than six million Australians and currently draining our annual taxpayer funded budgets to the tune of $53 billion, that this issue is not at the top of the national agenda places a huge question mark over the quality of our collective vigilance. Without rights or anyone to turn to, the overwhelming socioeconomic consequences of misguided family and child protection policies reach deep into every community. A Sense of Place Publishing John Stapleton: + 61 411 686 871. Peter van de Voorde: + 61 428 648 691.